First discovered by The Drive on Friday, new footage has surfaced on social media showing the Chinese military testing three hypersonic glide vehicles from a high altitude balloon. The footage is a reminder that a hypersonic arms race is indeed underway, with the US, China, and Russia. 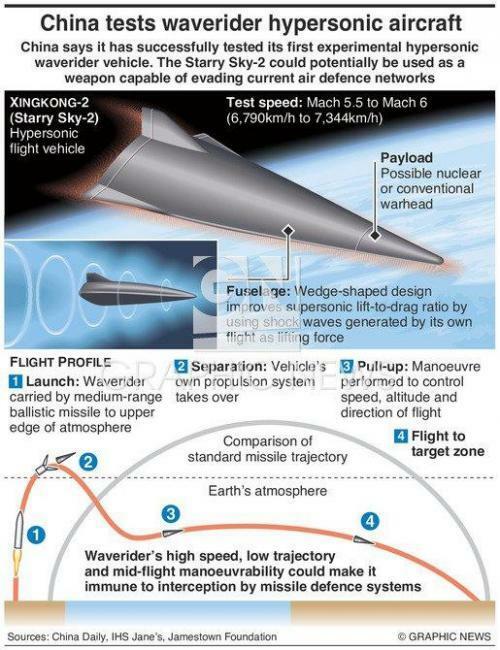 The Drive cannot authenticate if the wedge-shaped payloads harnessed underneath the high-altitude balloons are, in fact, hypersonic weapons, but @Defengchao who posted the footage on Twitter is confident that they are. "A test using a high-altitude balloon to launch the flight vehicle has been successfully performed, allegedly, this was exactly the test which closed a large area of airspace in the Northwest of China," tweeted @Defengchao. @Defengchao then posted a video showing the launch of the high-altitude balloon carrying the hypersonic weapons from a military facility in northwestern China. This balloon could have been launched into what is termed "near space," defined as the area of Earth's atmosphere between the Armstrong limit (11–12 mi) above sea level, where the hypersonic weapons were then released and glided back to Earth reaching speeds plus Mach 5 (+3,836 mph). 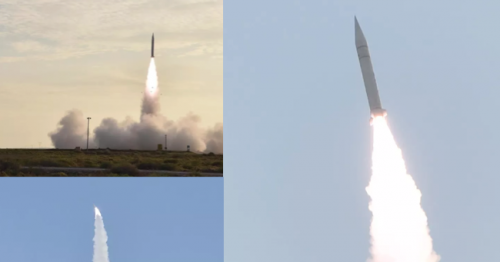 Early Saturday morning, @Defengchao released more footage of the hypersonic weapons. Cao said the three scale models (D18-3S, D18-1S & D18-2S) released in the test, were manufactured by the Chinese Academy of Sciences (CAS). Cao specifically said one of the weapons had a cantilever wing design, a rare hypersonic configuration that hints China's hypersonic program is rapidly accelerating. In another tweet on Saturday morning, the mysterious Twitter user, most likely directly or indirectly connected to the People's Liberation Army (PLA) said to expect more tests in the future. Since these are unpowered flight vehicles, which can only beyond the sound speed, more tests should follow as expected. Last month, we reported that China allegedly tested a new hypersonic missile that would be capable of penetrating any missile defense system in the world. The Starry Sky-2, which is an experimental design known as "waverider," rides the shock waves generated during flight. The missile could one day carry conventional and or nuclear warheads undetected through US missile defense shields. According to the China Academy of Aerospace Aerodynamics (CAAA), an aerodynamic research institution in Beijing and part of the state-owned China Aerospace Science and Technology Corporation (CASTC), conducted the hypersonic missile test in northwestern China. The CAAA released a statement, indicating the Starry Sky-2 was carried into space by a solid-propellant rocket before separating. After separation, it descended to lower altitudes as it autonomously conducted extreme turning manoeuvers, reaching Mach 5.5 for more than 400 seconds, and reached a top speed of Mach 6, or 7,344km/h (4,563mph), the CAAA WeChat statement said. However, the CAAA did not mention what the intended purpose of the missile would be used for, other than commenting on how hypersonic technologies could further China’s aerospace industry. Although, the missile is still in the development stage and probably a few years out from series production, waveriders could be used to carry conventional and or nuclear warheads capable of penetrating the world’s most advanced anti-missile defense systems. Earlier this year, Gen. John Hyten, commander of U.S. Strategic Command, told the Senate Armed Services Committee that the US is extremely vulnerable to future attack via hypersonic missiles. "The first, most important message I want to deliver today is that the forces under my command are fully ready to deter our adversaries and respond decisively, should deterrence ever fail. We are ready for all threats. No one should doubt this," Gen. Hyten said in his opening statement. "we [US] don’t have any defense that could deny the employment of such a weapon [hypersonic missiles] against us." Hyten suggested the US is powerless against hypersonic weapon threats and has to rely on nuclear deterrence. He added, "so our response would be our deterrent force which would be the triad and the nuclear capabilities that we have to respond to such a threat." In mid-April, Lockheed Martin announced that it had won a $928 million contract to develop a hypersonic missile for the Air Force to counter Chinese and Russian missile defense systems. During the recent discussion at the Center for a New American Security (CNAS) in Washington, D.C., Gen. Paul Selva, vice-chairman of the Joint Chiefs, said China has yet to "mass deploy hypersonics or long-range [tactical] ballistic missiles," however, "they are able now to deploy those capabilities at a large scale" if they decide to move in that direction, he added. "If we just sit back and don’t react we will lose our technological superiority" over China, Selva said. While the Chinese continue to further their hypersonic program, it seems as the US is falling further behind the curve.